Over the last year, I’ve developed a bit of a fascination with bass drum pedals to the point of where I have rather too many of them. These include examples of strap drives, double-chain, direct drives and, as we have here, single chain designs. For at least the last fifteen years though, I held the belief that single chained pedals weren’t for me on the basis that they were potentially a little too flimsy and more for lighter players. More recently, however, now being older, wiser and having tried some single chain drive pedals again, I realised that my prior theory was, in fact, complete nonsense. DW’s new 5000AH4 design features its Accelerator single chain cam, traditional footboard, drum key, Dual Spring Rocker, Tri-Pivot Toe Clamp and rubber grip on the underside of the footplate. The beaters are DW’s 101 two-way model, the one with the felt/hard plastic combo. You also get a good-sized carry case as well. To play, the pedals are very fluid. Individually, the pedals themselves are slick and solid, the cams providing a fast and smooth playing experience. The linkage between the two pedals is very firm, giving no obvious shaking or slipping. 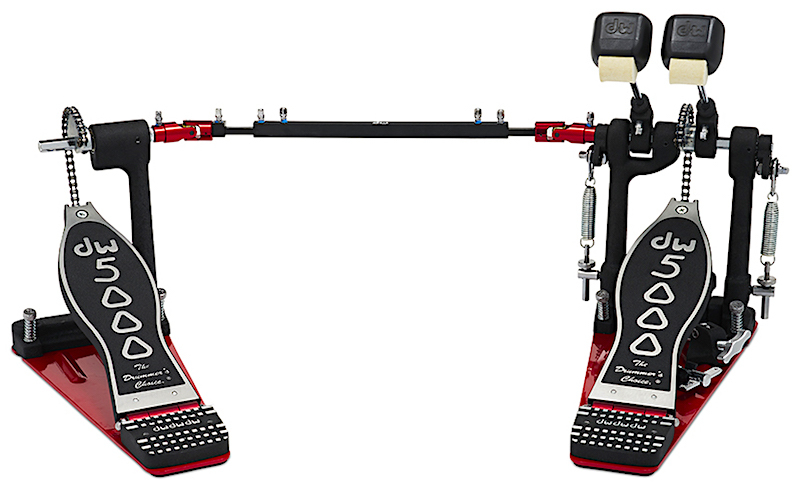 As the owner of an older version of the 5000 double pedal, albeit a double chained version, I like the updated features such as the toe clamp and the rubber grip on the underside of the plate (as opposed to the old velcro). These features alone make mounting the pedal to the bass drum hoop both quicker and easier. I spent a good number of hours with these pedals and at no point did I feel they might be unreliable. While my own double kick playing ability is somewhat limited to the more basic patterns, these pedals did make me feel more comfortable in what I was able to achieve. Overall, they are smooth, strong and retain the unmistakable visual of the 5000 line.